PD-L1 expression is a useful biomarker in predicting response to PD-1 and PD-L1 directed immunotherapies in a variety of tumor types. In UC, studies have implicated PD-L1 expression in tumor cells (TC) and tumor-infiltrating immune cells (IC) as having clinical utility, but the relative importance of each cellular compartment and the most predictive algorithm and PD-L1 expression cutoff remain unclear. 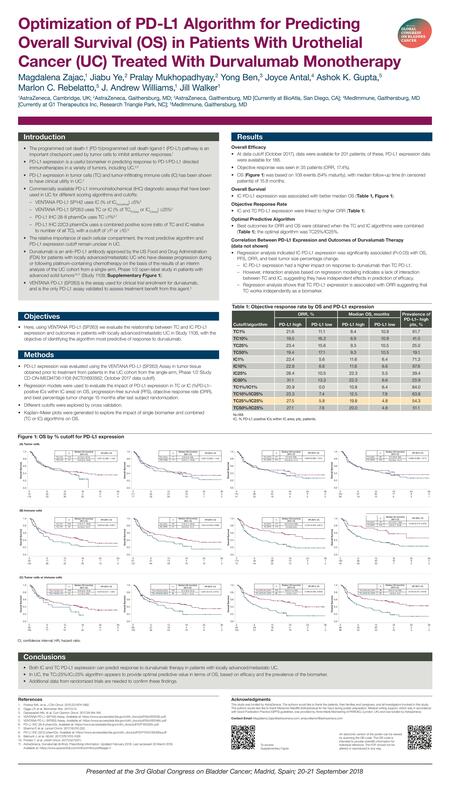 PD-L1 expression data (SP263 assay) from 188 patients in the UC cohort from single arm (durvalumab monotherapy) Phase 1/2 Study CD-ON-MEDI4736-1108 (NCT01693562; Oct. 2017 data cutoff) were assessed. Regression models were used to evaluate the impact of PD-L1 expression in TC or IC on OS, progression-free survival (PFS), objective response rate (ORR), best percentage tumor change and tumor shrinkage 15 months after last subject randomization. Kaplan–Meier plots were generated to explore the impact of single biomarker and combined (TC or IC [% PD-L1 positive ICs within IC area]) algorithms on OS. Both IC and TC PD-L1 were linked to higher ORR, and IC PD-L1 was associated with better survival in patients treated with durvalumab. IC PD-L1 had a higher impact on response to durvalumab than TC PD-L1, showing significant (P <0.05) association with OS, PFS, ORR, and tumor shrinkage. The best outcomes were obtained when TC and IC algorithms were combined, with TC25%/IC25% proving optimal (Table). In UC, the TC25%/IC25% algorithm appears to provide optimal predictive value based on efficacy and prevalence of the biomarker. Additional data from randomized trials are needed to confirm these findings. Magdalena Zajac and J. Andrew Williams are employees of AstraZeneca. Jiabu Ye, Pralay Mukhopadhyay and Jill Walker are employees of AstraZeneca and have owned stock in the company. Yong Ben is a former employee of AstraZeneca and current employee of BioAtla. Joyce Antal is an employee of MedImmune and has owned stock in AstraZeneca and GI Therapeutics. Ashok K. Gupta is an employee of MedImmune and has owned stock in AstraZeneca and Bristol-Myers Squibb. Marlon C. Rebelatto is an employee of MedImmune and has owned stock in AstraZeneca.